Nova’s underlying disease is accompanied with muscle weakness, which was mentioned by the Swedish medical team as a reason for her “poor eating”. We had been assured that Nova would start to eat after the placement of the button, but this did not happen. After 4 frustrating months, during which we tried to make Nova take in food orally and in which we did not receive any help from the Swedish healthcare system, I started to research on the Internet and found NoTube. Since I was born in Austria, I was able to assess quickly that the “Graz model” is trustworthy and in spite of strong resistance on the Swedish part, we started the weaning via Netcoaching. After long, hard but very instructive 11 months, Nova was classified as tube-free. This is an exceptionally long period of time, but can be traced back to her underlying disease and a hard, orthopedic surgery with corrective casting for several weeks about 3 months after the initial weaning. Nova made incredible developmental steps and we did not regret for a second taking this path. Today, she is 2 years old, demands specific food pro-actively and is happy and funny. She tries new food and beverages every day. We cannot thank the team of NoTube enough, we could never have come so far without them. 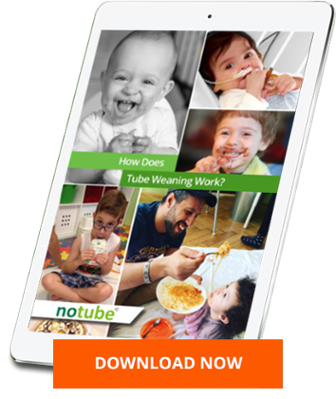 During this year of the weaning, I got to know many families with similar problems from all around the world and read about several methods – none of which were nearly as specialized and professional as the team of NoTube. Since I would love to share the experience I made with NoTube, you can contact me with all your questions – via Facebook or e-mail: isaschamschula@gmail.com. I am also happy to establish contact via NoTube.